Even if you have limited mobility in your knees, you can still get a great workout. Not being able to move your knee is a pain – literally. Especially when it comes to trying to get in a good workout. Your knees are a part of almost every common exercise, so it gets tricky when you have to work around one that is immobile. Whether you’ve had a recent injury or are battling a chronic condition, you’re going to have to get creative in order to stay fit. But the good news is that it’s totally doable. All you need is to know the right exercises and moves. Just be sure to check with your doctor before beginning any workout. Obviously the stair machine isn’t going to be your first choice with a bad knee. Neither will the treadmill unless you’re walking. 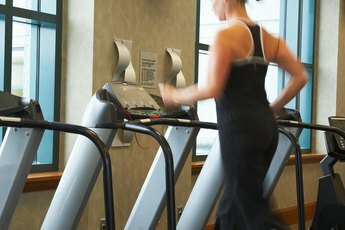 Depending on your level of mobility, the elliptical machine can be an effective alternative. The motion of an elliptical can use a combination of both arms and legs for power without straining your lower joints. The best exercise for you, however, will be swimming. If you have access to a pool, go ahead and dive in. As a non-weight-bearing exercise, swimming gives you the ability to take all pressure off your knees while giving you a powerful cardio workout. Getting an upper body workout is probably the easiest thing you can do with a bad knee or two. Most of the moves such as bicep curls, pec flies, triceps extensions and lat pulls can be performed in a supported, seated position that requires no movement from your lower body. To receive enough support, stick to the seated exercise machines at your local gym, which provide padded seats and back pads to help relieve any body pressure. This is the area in which you’re going to have the most challenging adventure. Bending your knees is a mainstay in most lower-body workout moves. Squats and curls will be off-limits, but there are alternatives that can help you keep your glutes, quads, hamstrings and calves strong while you recover. You’ll have no trouble completing several common exercises like deadlifts and calf raises without modification. For the quads, though, you will have to modify your routine. Try the Sports Injury Clinic’s isometric quad exercise, which allows you to contract and relax the muscle while only moving the knee a few degrees (see link in Resources). Because a number of knee problems are caused by issues in your core (such as muscle imbalances and weaknesses), it’s super important to keep training your core even while you’re injured. While the range of motion in your knee will limit your options, you can still take on many popular core-building moves including leg lifts and planks. You also can use a stability ball to do bridges without bending your knees if you prop your legs on the ball and keep your legs straight. For your lower back, add in a few sets of supermans, and you’ll have a total core workout that can help you build up a stable midsection despite your knees. BlackDoctor.org: Great Cardio for Bad Knees?